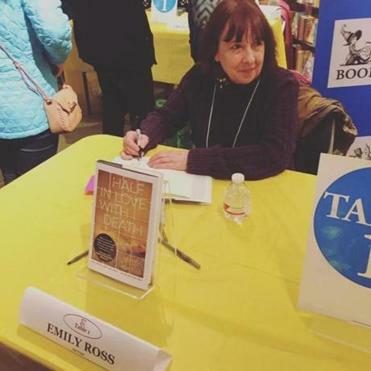 Emily Ross at a book signing. Emily Ross always wanted to be a writer, doing so “around the edges,” she said, crafting short stories while raising two children and working as a software developer. When the kids grew up and struck out on their own, the 64-year-old Quincy resident had time to devote to her craft. Which she has done in winning style: Ross’s first novel, “Half in Love With Death,” was released in December and named a finalist for Best Young Adult Novel in the International Thriller Writers Organization’s 2016 Thriller Awards. Winners will be announced July 9 at the group’s annual gala in New York City. Her novel was inspired by the true case of serial killer Charles Schmid of Tucson, and it is dubbed a “psychological thriller,” with 15-year-old Caroline as the story’s voice. The book has sold well and has gotten a lot of blog buzz, she said. She’s done appearances, which she confessed “is a bit out of my comfort zone,” and has one coming up May 14 at Barnes & Noble in North Dartmouth. Ross is also working on another young-adult novel now, one set in Quincy.